Maine Sen. Susan Collins' Deal On Health Insurance In Doubt : Shots - Health News Even if the Republican from Maine can get her party to go along, her suggestions to bolster the individual insurance market may be too little, too late. Sen. Susan Collins, a Republican from Maine, walks through the Capitol with colleagues in early December. Sen. Susan Collins, the Maine Republican whose vote was pivotal in pushing the GOP tax bill forward last week, thought she had a deal to bolster health care protections in exchange for her support. But it's now unclear whether her strategy to shore up part of the Affordable Care Act will prevail or that it would produce the results she anticipates. The tax bill repeals the ACA's fines for the individual mandate, which requires most people to have health insurance or pay a fine. Collins says she would vote for it if Senate Republicans promised to allow a vote on two other health bills. One would reinstate payments to insurers in order to cover discounts that the ACA requires those insurers to provide to their lowest-income enrollees for out-of-pocket costs. President Trump ended those "cost-sharing reduction" payments in October. The bill that Collins supports would extend the payments for two years. The other bill she supports would provide temporary funding for reinsurance pools, which help insurers pay claims for the sickest — and most expensive — customers. Reinsurance would help bring down premium costs for everyone else. Before the tax vote, Collins said in a statement she was "deeply concerned that the repeal of the individual mandate would almost certainly lead to further increases in the cost of health insurance premiums – premiums that are already too expensive under the ACA." Senate Majority Leader Mitch McConnell, R-Ky., said on the floor that he would support Collins' demands. McConnell added that he would seek to restore the cost-sharing subsidies, "ideally prior to the adoption of any final tax reform conference agreement and certainly before the end of the year." He also said he would "support passage of your bill" to create the reinsurance program, with the same timing. But it's nowhere near that easy. The tax bill is now the subject of final negotiations between the House and the Senate. First, even if the bills pass the Senate, there is little to suggest that the House Republicans would go along. On Tuesday, House Speaker Paul Ryan, R-Wis., reportedly told other House leaders he was not a party to Collins' health care deal with McConnell. Ryan had previously expressed opposition to restoring the cost-sharing payments. In response to Ryan, Collins on Thursday signaled that she might not vote for the tax bill's final passage. But would Collins' changes offset the elimination of the mandate? Some analysts question whether the bill restoring the federal cost-sharing subsidy payments could actually do more harm than good. "It's a mess," says insurance industry consultant Robert Laszewski. Many states allowed insurers to raise premiums to make up for the loss of the federal cost-sharing reduction payments. So passing the law now, at least for 2018, would require insurers to make refunds to individuals and the federal government for those overpayments. "It's certainly too late to affect premiums for 2018," agreed Aviva Aron-Dine, a former Obama administration health official at the Center on Budget and Policy Priorities, a progressive think tank. "It's also too late to help with market disruption for 2018." Going back to the original payment system, she says, would result in "a whole group of people who would actually see higher premiums." In addition, the tax bill's elimination of the federal health law's individual mandate penalty would also raise premium costs – beyond the expected yearly increases – by an average of 10 percent, according to the Congressional Budget Office. That's because the CBO estimates that about 13 million people would give up their coverage by 2027. Fewer people buying insurance means that the insurance pools would have larger numbers of sicker enrollees and would be more expensive for insurers, who would likely raise premiums. 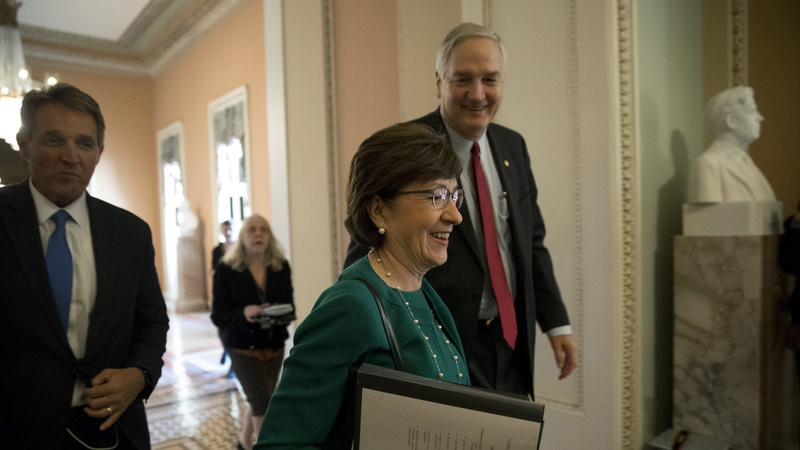 The elimination of the mandate penalties is permanent, but Collins' bill would fund the cost-sharing and reinsurance programs for only two years. Because of that, says Timothy Jost, a former law professor and expert on the health law, "I don't think it's going to be much of a carrot" to encourage insurers to stay in the individual market. Analysts were more upbeat about the potential impact of the reinsurance program. The program would be similar to one that existed in the first years of the health law, "and it did in fact reduce premiums by about 10 percent," Jost says. But in order to set up such reinsurance programs and be eligible for funding, states would have to apply for special waivers under the health law. Federal officials have been slow about approving those. "States would have to get their act together politically," says Jost. "And the money might run out before [the federal government] gets to your state." "Funding CSRs and funding reinsurance is expected to decrease average premiums in the market by more than the 10 percent [increase] CBO is projecting" for getting rid of the mandate fines, says Chris Sloan, a co-author of the study. But he warned that when the funding runs out, "we're back where we started." Kaiser Health News, a nonprofit health newsroom, is an editorially independent part of the Kaiser Family Foundation.